Connor completed the summer reading program. Each week, if the participant reads twenty books, they get a book as a prize. If you complete five weeks, you get a blue bag as a bonus. Mommy was very diligent at taking Connor to the library and picking out lots of neat books every week. 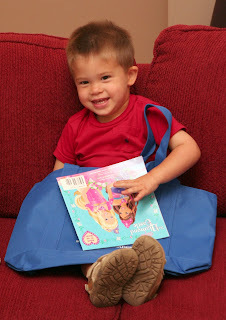 This past week Connor finished his 100th book and he picked out a Barbie princess book and got his blue library bag. 100 books! Obviously a proud moment. What a guy.